Everyone is welcome at the PSU Library, and our services will help you no matter where you are in the term. The guide below covers some of our most frequently asked questions, but is by no means comprehensive. View all of our student services at the Library for a full list of resources. The PSU Library website has services and research guides will help you throughout the term. Find your next research article or search a database for class. Our subject guides connect you to what you need for a specific class or subject. Our tutorial videos show you how to use our website, research databases, citation software, and other research tools. Finally, Ask a Librarian for research help if you have any questions. Get help with your research at the Reference Desk on the 2nd floor in the main computer lab. Reference Librarians will assist you with all stages of your research, including brainstorming topics, finding articles, and citing sources. Furthermore, you can get research help in person or 24/7 online. Get research help whether you are forming your research topic or burning the midnight oil in your dorm. Computer labs are on the 1st and 2nd floors. Both labs have PC and Mac computers, wheelchair accessible stations, scanners, and color printers. Print from your own laptop at the Library, or at one of the lab computers. The Learning Center on the 2nd floor will help you with tutoring, study skills, and many other services. Drop in tutoring begins early in the term and is available throughout the term. The full schedule of drop-in tutoring is available on the Learning Center’s website, along with other services designed to help PSU students succeed. The Writing Center Outpost will help you with your paper at any stage of the writing process. Drop in from 9 a.m. to 12 p.m. on weekdays during the term. 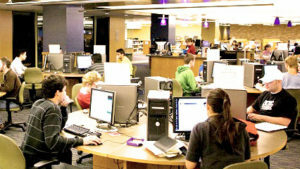 The 1st, 2nd and 3rd floors of the Library have tables and technology arranged for group collaboration. Designated quiet floors are on the basement, 4th and 5th floors to provide students with places to focus and study. Study rooms are available throughout the Library for a space to study, practice a presentation, or work on a group project. 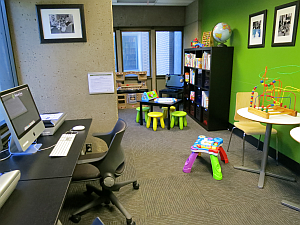 A special family study room is available for students with children, while other study rooms have specialized equipment for collaboration or different layouts to accommodate different groups. Furthermore, you can book study rooms online up to a week in advance. Check out keys for your study room from the 1st floor Circulation Desk. Many course textbooks are available for checkout as course reserves. Search the Library Catalog to see if we have your textbook in the reserve collection behind the 1st floor Circulation Desk or on the shelves. Select “Course Reserves” and type in your course number to see if your course textbook is on reserve. Course reserve textbooks can be borrowed for a short period of time for students to read, study, and take notes. Borrow equipment from the Portland State University Library, including mobile device chargers, headphones, graphing calculators, laptops, and iPads from the 1st floor Circulation Desk. 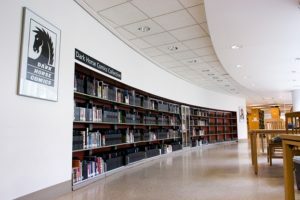 When you have time to spare, check out the unique collections at the PSU Library in print and online. The Dark Horse Comics collection is located on the 3rd, 4th and 5th floors. PDXScholar, PSU Library’s digital repository, contains research by Portland State students, staff and faculty, along with local research, university archives, theses and dissertations, faculty profiles, and open access textbooks. The Dark Horse Comics collection is available through a partnership between Dark Horse comics and the PSU Library. The collection has over 10,000 comics and is updated throughout the year. Dark Horse Comics are available for checkout from the PSU Library on the 3rd, 4th, and 5th floors. Special Collections and University Archives have many collections available online. These include a digital gallery of PSU archives and the Viking yearbooks.